Loading 44 mag with trail boss...what am I missing? Thread: Loading 44 mag with trail boss...what am I missing? I marked my case on the side with a marker where my Lee HP SWC would seat at the top crimp line and then took a pencil and marked the measurement On an unsharpened pencil so after I tricked powder in the case I can insert the pencil til it lines up with the mark and measure the max compressed powder charge. To me this would be crushing it so for a max load I would back it down .2 grains. I used starline brass sized and trimmed to 1.275" with a primer installed to keep the power inside the case. My max, compressed fill line where the base of the boolit would from press the powder when I seat it to the top crimp line was 6.2 grains. So as far as I'm concerned 6 grains would be a max loading so I don't crush the trail boss powder. The 70% reduction came out to 4.34 so 4.4 grains would be a a starting load. The reason for my post is I see loads all over the place saying you can load up to 7.5 grains or more with a 240 grain SWC? This would be crushing the powder without a doubt. So I am confused by th load data I've seen listed using this powder. This probably explains why I've read that some shooters have had less than spectacular results with fliers. It also makes perfect sense when I tried this powder the summer before last with my devastators. I just went off book and did loads from 6 grains to I think all the way to 8 or 8.5. Don't remember. But I had some 400 fps variances with the sane loads across my chrony. Now I know why, the powder was compressed. Guess when you use this powder I would suggest not to go by what ever load data you see listed in the books and do yourself a favor and measure like I did and and then do the math and start with 70% percent less and work up. I know this common knowledge with trail boss powder but I didn't realize there was no where near the case capacity for the powder loads I've seen listed in a lot of load data I've seen. I also did the same measurement for some FREE 180 grain hornady xtp's I received from hornady when I bought a die set...or I would have never bought them. 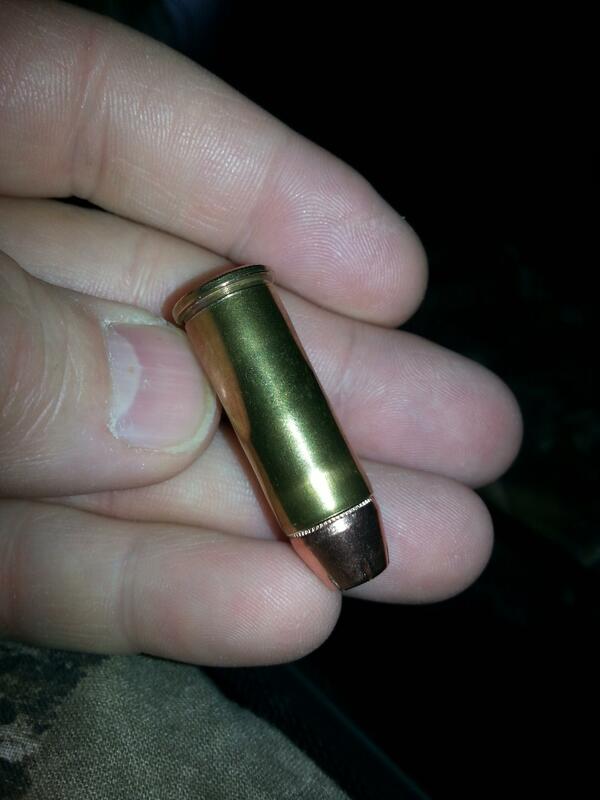 The trail boss compression load line was at 9.2 grains. So to me 9 grains max and a start of 6.5 grains since 70% came out to 6.44 grains. Should be fun. Going to load some up to plink in my wrist braking S&W 329 nite guard. Glad I checked my case capacity this time around. I just loaded some 45 colt with the boolits seated pretty far out and went with a 5.2 grain load with a 255 grain boolit. I'm going to have to find a case or pull one to make sure I have at least 70% powder in them. Last edited by Tripplebeards; 02-08-2019 at 03:30 PM. Hodgdon Trail Boss .430" 1.620"
Watching this thread as I'm close to setting up on a run of 1000 44Mag 240gr cast with TB. I run Trail Boss in my 41 mag cast loads and absolutely love it. Here’s what I came up with today. My boolit is seated deeper but if it wasn’t and seated at the same depth as your listing it would crush powder. I would assume that load is exact boolit specific and to load exactly at the same seating depth. Guess when you use this stuff I would advise who ever to figure out your seating depth, measure, and do your math. My 180 grain XTP load of 9.0 grains I swear probably crushed my powder. If not it’s definitely compressed. Sorry for the sloppy penmanship but I’ve been up since yesterday plowing slow. You can see my marker mark on the 2nd case from the right where the base of my boolit seats. I didn’t want to cut a case short like I’ve seen other posters do and use for a measuring devise. I realize these aren’t full throttle loads so I don’t need a monster crimp but how does my crimping look? I used my lee factory crimp collet die. The other thing I was courious about is even after full length sizing all my brass was the variance in neck tension...some boolits slid into the case with no effort and some you could feel a good grab. All cases are the same brand, trimmed to the same size, and all flaired to the same adjustment to help the boolit start. 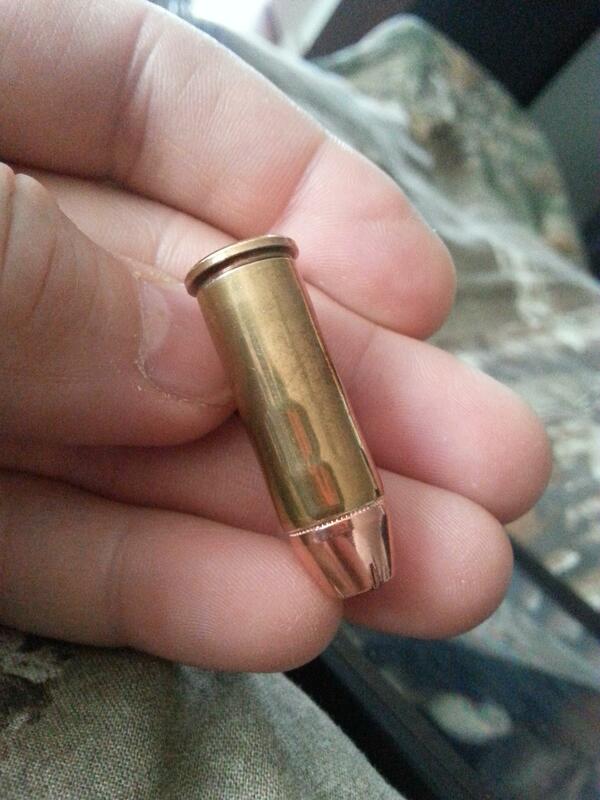 Could this be from shooting cases in different firearms and pistols or hotter or lighter loads? I would think either way after full length sizing they would all have the same neck tension? Last edited by Tripplebeards; 02-09-2019 at 01:03 AM. Use 6 grains. It's that easy. been using that load for many years with 220 FPs designed for 44-40.
some boolits slid into the case with no effort and some you could feel a good grab. I’m sizing my boolits through a .430 lee sizer and gas checking at the same time. PC was applied before sizing so it’s all getting squeezed down to the same diameter. There shouldn’t be any variance in thickness. I believe I noticed it more with the jacketed 180gr XTP bullets. You can see in the photo that some of the casings squeezed out to seat the j words and some of them went in very easy. 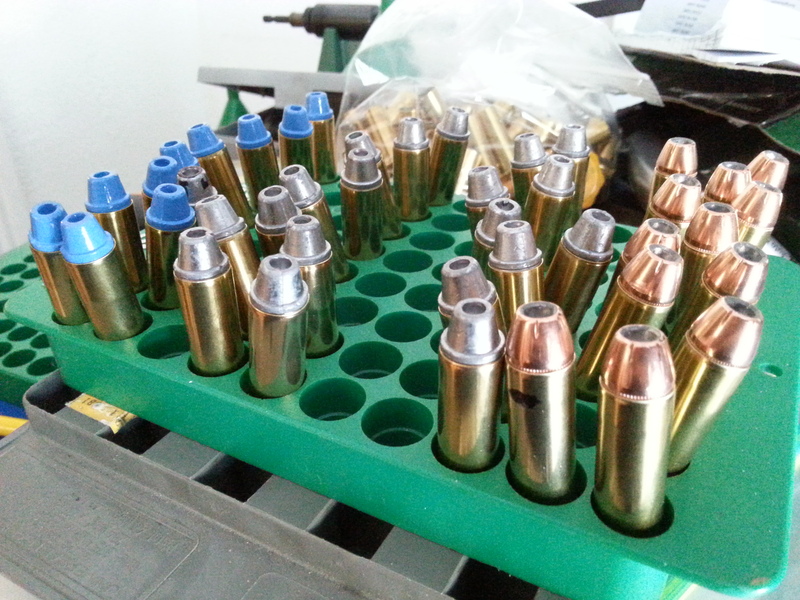 I gave them a pretty good hefty with the collet factory crimp die to make sure they are held in place so hopefully a good, heavy crimp will provide a consistent pressure. Last edited by Tripplebeards; 02-09-2019 at 01:06 AM. Clear PC goes on a lot thinner than most colored. you said you FL sized all the cases then there are 2 possibilities, you have some thin walled cases or some of the boolits are smaller than the others. mic the blues and the clear and see if they are all the same size. I checked some boolits from that mold and the HiTek ones measured .430 and the PC'd .434 unsized. alloy, casting and mold temp could make that vary some also. I justed loaded up 20 of the j words in federal cases all processed the EXACT same way. All the bullets had an equal feel of neck tension when being seated. It’s gotta be the star line cases I was using. They have been fired in 4 different 44 mags at different pressures. I believe the cases fault because it was happening with both pc and jacketed bullets...and once again my cast boolits are being sized in al eye .430 sizer die after PCing so the various pc thickness is getting squished down to all the same diameters so that should not be a factor. My PC’d bollit is not going to grow in various diameters after being sized. Last edited by Tripplebeards; 02-09-2019 at 05:26 PM. I've never heard of anyone annealing straight wall pistol cases? I suspect that if that was done unevenly (from case to case), then afterward, the springback from sizing and expanding might vary from case to case...giving you varying amounts of case tension on your boolits. I deleted that but you were to fast to respond. I anealed a bunch of Winchester cases last week and thought these were the ones. These were starline, and I did not aneal them. If I did it would explain what’s going on. I can see in some of the cases where theirs a little flair “bullet bulge” in the casing all the way from the mouth to the base of the bullet where is slid in oversizing the case when seating it. The others that went in with little force of course no expansion from the bullet going into the case. I used my cylinder as a go no go gauge and they all fit fine. Over the years I’ve had this with various bottle neck cartridges as well. I wonder if they just didn’t get sized properly in my fl sizing die or had some spring back in the case or Old, brittle brass giving spring back? Last edited by Tripplebeards; 02-09-2019 at 05:38 PM. is this on one side of the case? or all the way around? All the way around like the straight wall case is too narrow. Since I was on roll with trail boss to try and make some powderpuff loads for fun to try in my nite guard I trimmed down 19, 44 mag PMC cases I had laying around to minimum 44 special length. 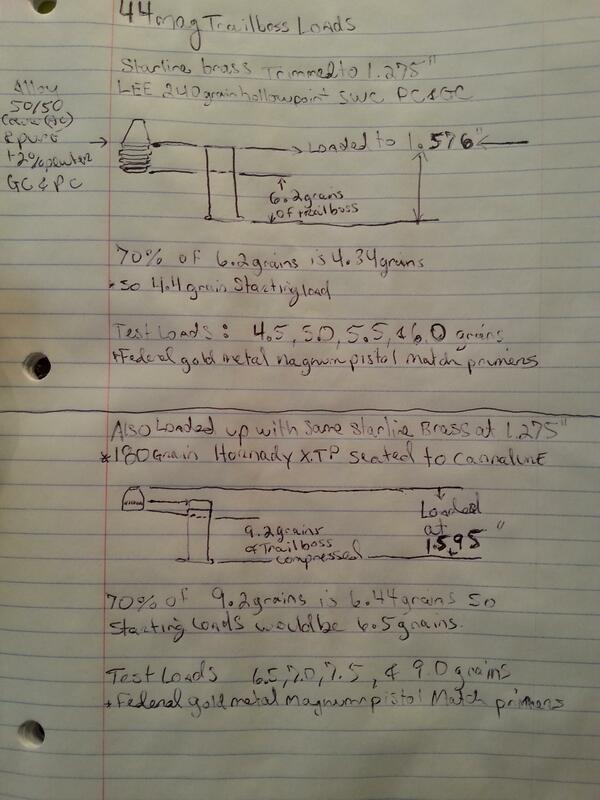 Measured a 180grain XTP that would be seated to the middle of the crimp line and got 7.4 grains. 70% was 5.18 grains so I loaded them up with 5.2 grains of trail boss. I had bulges on one side of the case with crooked seated bullets. Never had that happen before. Figured the cause out...I didn't flare the necks enough. Pulled the bullets, fl sized them again, and gave a good flair, problem solved and the bullets seated evenly. The one thing I did notice is when I flared the case both times that I had a little budge around the exact middle of the case. I was using 44 mag dies so I wonder if it was a die adjustment issue? They all still slid nice and easy into my cylinders...I use it for a go no go gauge. I one again had the same expansion all the way around the case when the bullet seated. I'm wondering if my fl sizer die is a littler smaller in diameter than spec? Guess it's no big issue since I've been loading 44 mag ammo with it for decades and they all feed and go bang. I'll be courious how tame my nite guard will be with these. I tried some 265 grain devastators worth 6 and 6.5 grains of trail boss in a 44 mag case the summer before last and it felt a little less than a 357 with a 5.5" barrel. Last edited by Tripplebeards; 02-10-2019 at 06:16 PM. I'm wondering if my fl sizer die is a littler smaller in diameter than spec? I had been assuming your were 'expanding' the case? Which should negate any issue with a potentially undersized FL size die. Last edited by JonB_in_Glencoe; 02-11-2019 at 10:38 PM. Here is a few pics of one of the loaded 44 S&W loads. They feed loosely in my my cylinder so I plan on firing them. You can see the middle of the case has a little bulge looking like I seated a longer bullet. Also you can see where the case expanded a little completely around where the bullet neck seated and where the full length sizing die stopped about a 1/4” before the bottom of the case. These are all pictures of the same bullet with different light and angles. The middle pic has a reflection on the angles. It’s not scratched. It’s a reflection of me taking the pic and almost looks like the bulges are over exaggerated so I took a couple more photos. The buldge in the middle of the case showed up after flaring the neck, not when crimping or seating the bullet. It buldged the first time when I barely flared them and the second time when had to redo them and full length sized the cases because I had crooked bullets from a lack of a good size neck flare. Maybe I’ll try a bigger flare next time around to see if it eliminates the middle case buldge. Last edited by Tripplebeards; 02-11-2019 at 01:38 PM. What's that metal thing at the end of the brass case? OK did you measure the diameter of the J-Words? Last edited by Conditor22; 02-11-2019 at 02:00 PM. Lol, yeah, I know. I got them free from hornady with my dies. It was the lightest 44 cal bulllet/ boolits I had in my inventory so I could feel the least amount of recoil for my experiment. 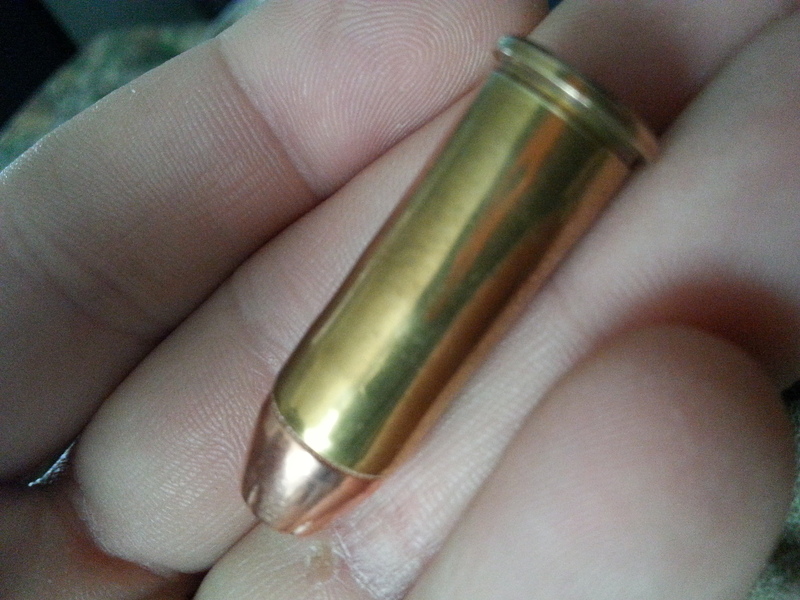 No, I didn’t measure the bullet diameter yet. Last edited by Tripplebeards; 02-11-2019 at 02:35 PM. I just measured. The base of the boolit is .430 and ten it tapers really quick. About a 1/8" or so up from the base it is.428". Either that J word is really soft to immediately expand and swell to grab the rifling or they're going to be very inconsistent. They're just for fun anyways to see how little felt recoil will be perceived.